Hey if you have creative mind then you should play our game School Decorating Doll House Town : My HomePlay. Now you can create a beautiful doll house.Are you student and Do you want to design a school room? 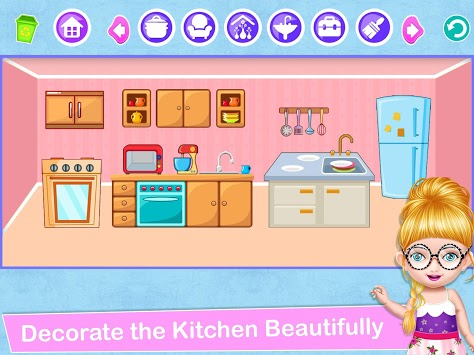 you have chosen a good game to play toon town doll house.In this app you can decorate a room with dollhouse and other play home items.Be creative when you are baby doll house decorating.Out school dollhouse app is for enable to design a wonderful dream house.my home play developed by a senior designer and developer.If you like house design game then you should be play our school dollhouse game.Download and enjoy the toon town homeplay game. When you will enter main menu You will see beautiful school environment for child. And when you will enter selection scene you will meet five beautiful and princess dolls. Meet baby doll witch You had chosen in princess doll selection. Say hello to your new friend and start create a wonderful room as you want. You can design rooms like as bedroom,kitchen,washroom and classroom. Play dollhouse simulator game because it is latest of 2019. Every Child should be know that how to decorate classroom and school. Friends you can show your designer talent by decorating play home child or baby doll house. Our play home game or doll house game is very easy to play because it's control is very smooth and touchable. Features: My high school doll house decorating or play home game. Play for especially for girl. Multiple house items such as bed,chair,fan,door. Cool colors of wall and floor. Fun activity classroom school simulator. A educational learning game for kids. Play for become interior designer.